See what I did with the quotation marks? Leaving the lame puns behind, it is, in fact, March. Going to start the surgical countdown. That would make today T-24 days. 24 days until my life changes forever. 24 days until I start leaving the fat armor behind. So, all that being said, I’m really focusing on trying to keep the workout intensity levels up. Today was a good example. 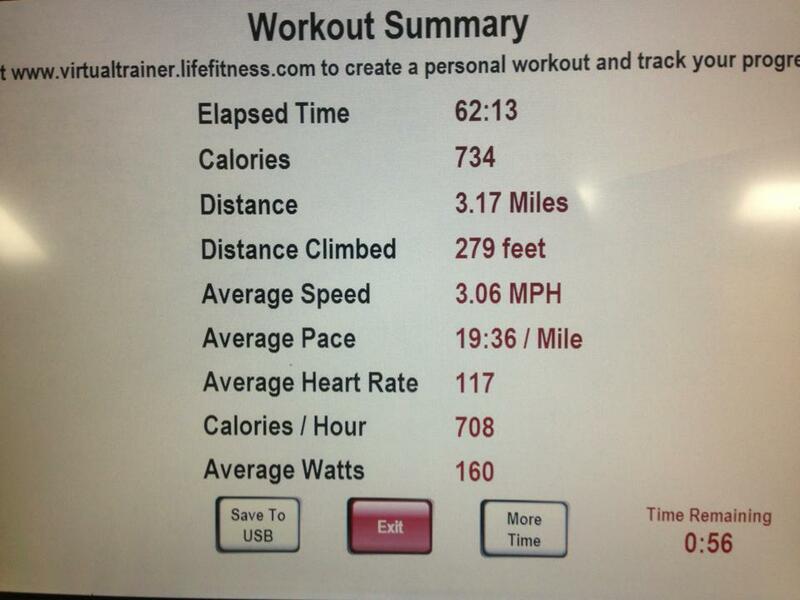 I managed to burn over 730 calories and cover over 3 miles. For someone who had trouble walking a mile without being out of breath and succumbing to blisters, I’ve made some progress. I almost feel like once the weight is reduced, I’ll be able to do anything. Granted, a marathon is probably out of the question, but I think that 5K is firmly within my wheelhouse. It probably won’t be pretty, and it probably won’t be fast, but I just know that the feeling of accomplishment will make up for the pain. Pain. That’s an interesting subject. When Stubby reared his ugly head back in 2010, most of the problem was that my diabetic neuropathy prevented me from feeling what should’ve been excruciating pain. As a result, I lost part of a toe. It seems that the more my glucose has been under control, there’s actually been a return of some sensation to my feet. It’s good and bad… good in that I have a little more feedback as to how I’m doing in the blister department, and bad that I know when my feet hurt. My primary issues with the workout time have been achy ankles and other assorted joints. My ticker feels better than it has in a long time, as does my general health. My hope is that the less weight I’m carrying on my joints, the less pain they will have to endure and the less general abuse they will take. My hope is that it will lead to less likelihood of joint replacement in the future. In other good news, I’m wearing a shirt from the depths of my closet. It’s one of my favorite Disney polo shirts (anyone who knows me knows that I pretty much live in polo shirts (and I don’t pop the collar) so it’s nice to pull one out of the closet that doesn’t have holes or is so threadbare from constant wear. See, I set a goal for myself when I embarked on this journey to not buy any new clothes unless absolutely necessary. There are a couple of shirts with holes that Supportive Partner Woman (Pyromaniac?) has pledged to burn as soon as I no longer need them. That does bring to mind something I need to think of. With the speed in which weight can come off post surgery, refreshing the wardrobe can be a tad expensive. Guess I will have to haunt thrift stores and secondhand shops. I’m usually not opposed to wearing loose-fitting clothes, so that’s a plus. I’d hate that some of my favorite t-shirts wouldn’t be worn. I should be able to fit in the baseball jersey collection sometime during the season. That’s a good thing… and maybe even actually close the jersey? That would be awesome. At any rate, that’s what I have for today. I will continue to keep stuff posted as the date comes closer.